It really took me a minute to become enthralled in this contemporary romance novel entitled Return to You by Samantha Chase. I don’t know why, but I had a hard time with this one. Nevertheless, I pressed on and instead of putting this in my ‘did-nit-finish’ pile, I kept on reading and that is when something happened. It got good and I suddenly wanted to read more about James and Selena and who they were and how they came to be. I digress. The story of these star-crossed lovers as a cute one with other characters from Samantha Chase’s Montgomery Brothers series. These appearances were not overwhelming and although I had not read any other books in this series, I did not feel at a loss as I read about James and Selena. The story was well written and grew to have a good pace. 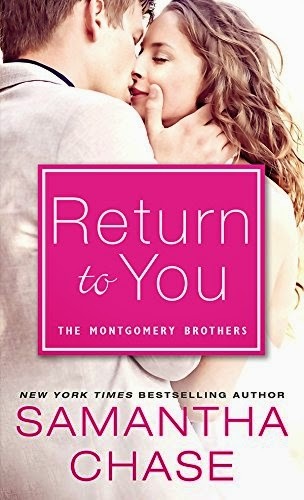 I enjoyed the characters and even through Return to You ended, I am sure to continue to read about the Montgomery Brothers as they continue to disrupt the lives of their single relatives, one happily-ever-after at a time. And as if you had to ask, I recommend you skip on over and read Return to You by Samantha Chase, even if you are a fan of this series or not, this story is one definitely worth the effort. Firstly, I would like to say I liked the main characters of When Joss Met Matt in this debut New Adult romance novel by Ellie Cahill. The story of how these young co-eds met during their Freshmen year in college and into adulthood is absolutely relatable to several stories shared by many when recounting their wild and crazy college years. The story in this novel is very true to form as it definitely captured how relationships end and begin and end again throughout those years of self-discovery.